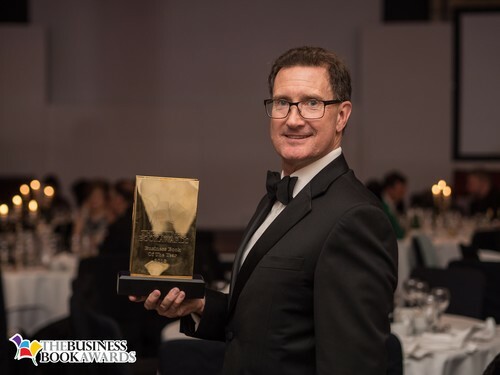 The organisers of the Business Book Awards are thrilled to announce the overall winner of the 2018 inaugural event is Campbell Macpherson, author of The Change Catalyst, a book about the secrets to successful and sustainable business change. Campbell Macpherson from Oxford, UK said, “I am stunned! Thank you to the organisers and all the judges for putting on this wonderful evening. It’s all about leadership, and it’s all about leaders embracing change and leading change through their organisations. There are so many good books at these awards that I am now going to go out and buy. Campbell Macpherson has been helping business leaders clarify their strategy and instigate sustainable change for more than 30 years throughout the UK, Europe, Australia, USA, Asia and the Middle East. He has a remarkable wealth of experience across a variety of industries and business disciplines. He has been a board member, Strategy Director, HR Director, Marketing Director, eBusiness Head and internal change leader. He is a strategic change adviser for many dozens of organisations via his consultancy Change & Strategy International Ltd.
His work has included advising the Abu Dhabi Investment Authority, Zurich Global Life, IFDS/State Street, International Personal Finance, Friends Life, Aviva, GoCompare, iPipeline, James Hay, Cofunds, Sesame, Misys, Openwork, Centaur Media, BP, Capital Radio, BBC, Telewest, AMP, American Express, Lazard and Andersen Consulting. Campbell Macpherson has a physics degree from Melbourne University. He lives in Oxford, UK and is married with two adult children. He divides his time between the UK, Australia and wherever his clients need him to be. The awards celebrating the best in UK business books published in 2017 took place at The Grange City Hotel, London and the overall winner was decided by a majority vote of the judging panel. The nominated books were divided into seven categories: Startup Inspiration, Selling the Dream, Leading the Team, Embracing Change, Thought Leader, Self-Development and the Judge’s Choice. Lead Judge John Williams is the founder of The Ideas Lab, author of Screw Work, Break Free and Screw Work, Let’s Play. Will Dean is co-founder and CEO of Tough Mudder and was included in Fortune's '40 Under 40' list and received the US National EY Entrepreneur of The Year Emerging Award. He was born in the UK and is a graduate of the University of Bristol and Harvard Business School. Lead Judge Andy Lopata is a mentor, trainer, author of three books on networking skills, networking strategy and referral strategy. Strategic Tendering for Professional Services by Matthew Fuller and Tim Nightingale (Kogan Page) Matthew Fuller has 25 years' experience of working in the professional services sector. He has led global business development and marketing teams at Allen & Overy Herbert Smith and currently White & Case. He has run training programmes throughout the world advising partners on proposals best practice. Lead Judge Martin Norbury is a Business growth advisor, award winning entrepreneur and author of Don’t Work Fridays. The Change Catalyst by Campbell Macpherson (Wiley) (Also overall winner). Lead Judge Ginny Carter is the author of The Author Maker, a business book ghostwriter and writing coach. Lead Judge Carl Reader is an expert and advisor to small businesses; columnist and author of The Startup Coach and The Franchising Handbook. Lead Judge Suzanne Collier is the founder of bookcareers.com, the Careers Guidance and Development Consultancy to the book and publishing industry. Tom Bird's business career stretches over 20 years and spans sales and sales management as well as personal development and performance improvement. He is a director of RTP and has been involved professionally in developing people to realise more of their potential since 2000. Jeremy Cassell has worked as a freelance trainer for 12 years. Before that he was National Training Manager for L’Oreal and National Sales Training Manager for Walker’s, part of Pepsi. Before entering the business world, he gained experience in teaching English and History. Lead Judge Lucy McCarraher is the founder of the awards, author of 11 books and co-founder and Managing Editor of Rethink Press. James Thornton is an environmental lawyer and writer. He is the founding CEO of ClientEarth, a not-for-profit environmental-law organisation with offices in London, Brussels, and Warsaw. The New Statesman named James as one of ten people who could change the world. The awards attracted 150 entries from a wide variety of publishers. The founder of the awards is Lucy McCarraher, author of 11 books, and co-founder and Managing Editor of Rethink Press. Lucy McCarraher said, “We felt it was time that the wide range of business authors were celebrated for the knowledge and expertise they make available through their books. “Our brilliant judging panel, made up of eminent authors, business people, publishers and experts, have brought their experience and integrity to the review process and ensured that all 150 entries have been given a rigorous and thoughtful assessment. I thank them all, along with Alison Jones, our superb and hardworking Head Judge. Lucy became a national expert in work-life balance, writing academic and business reports for clients and authoring The Work-Life Manual and The Book of Balanced Living. Her clients included multinational and blue-chip companies, large public sector and voluntary organisations, and SMEs. She has also worked as a coach with many individuals on their work-life balance and personal development. Lucy is the author of 11 published books, including her latest, best-selling How To Write Your Book Without The Fuss, with her business partner Joe Gregory; and the acclaimed How To Write Fiction Without The Fuss. Her first novel, Blood and Water, was shortlisted in a major competition and published by Macmillan New Writing, followed by Kindred Spirits and Mr Mikey’s Ladies. Lucy’s self-help books include A Simpler Life and The Real Secret, both co-authored with social psychologist, Annabel Shaw. The Real Secret was published by Bookshaker and Lucy subsequently became Commissioning Editor of the publishing company, contributing to its 14-year experience of niche business and self-development books. This press release was distributed by ResponseSource Press Release Wire on behalf of Business Book Awards in the following categories: Men's Interest, Entertainment & Arts, Leisure & Hobbies, Women's Interest & Beauty, Education & Human Resources, for more information visit https://pressreleasewire.responsesource.com/about.